Earn $0.49 in Rewards credit (49 points) What's This? Not all cables are created equal. Jagwire's high-quality Slick Stainless Derailleur cables help reduce friction and keep your bike shifting smoothly. They're pre-stretched to minimize adjustment post-setup, and they're double-ended for compatibility with Shimano/SRAM or Campagnolo shifters. 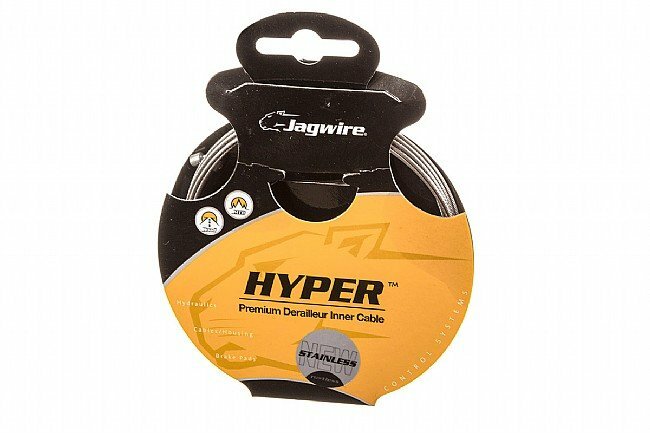 The Jagwire Slick Stainless Derailleur cable is sold individually. Each cable is 2300mm long. Standard 1.1mm diameter. Double-ended Shimano/Campagnolo. longer thinner than most, strong, works fine. Used this with Sram Rival 10 speed shifters and 11 speed rear Derailleur, for a longer wheel base comfort bike. Plenty long and the .1mm difference over the other leading brand did seem to make it easier to thread through the shifter housings. Can't say if the pre-stretching made a difference as I am frequently changing wheels and fine tuning the dialing in, though I imagine it must help. Very good cable that improves shifting. Good cables improve shifting and last longer. Upgrading your cables is one of the cheapest ways to improve your bike. I have used these Jagwire cables for years and have never been disappointed. Trouble free, long lasting shifter cable. I had used these cables a lot for my Shimano equipped bicycle, and they worked very well, in terms of durability and operation. So, I decided to purchase them for my Campy setup, and that was a different story. I tried two cables and both of them brokefrayed near the barrel connection. There is probably a difference in construction compared to a Campy cable and housing combo. A. Good quality. Why go with the more expensive stuff. Good price. No complaints. Quality is good and price is right. fits Campy or Shimano. Im not sure why I would buy the more expensive stuff. I set it up and then removed it almost right after when I went to E-Tap.